Or, why everyone seems to be a Yankees fan. 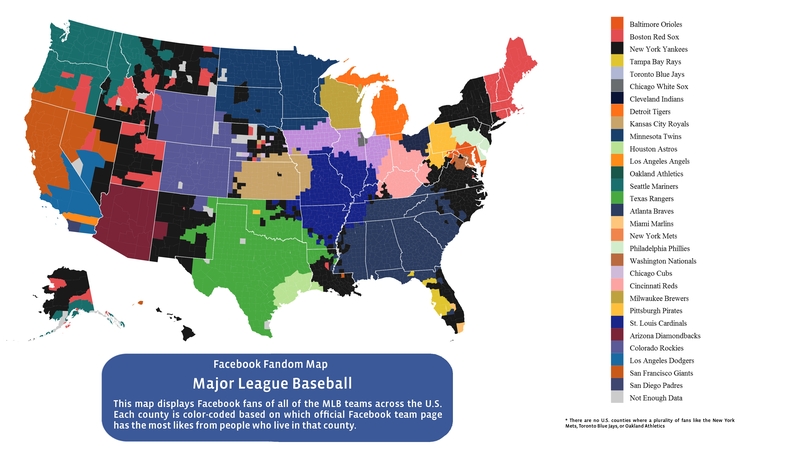 Today marks baseball's official Opening Day, and to celebrate, Facebook used some of its user data to map MLB fandom across the country. Specifically, Facebook went to MLB team pages and mapped the likes on each page county by county. Unsurprisingly, the Yankees appear — based purely off data — to be not only America's favorite team, but Louisiana's favorite team, Virginia's favorite team, Hawaii's favorite team, Alaska's favorite team, and New Mexico's favorite team. If you're a Yankees fan, this is probably a point of pride. For everyone else, the wide dispersement of Yankee fandom no doubt looks like the spread of some vile plague, a nasty pinstriped virus moving swiftly across the nation. "Red Sox Nation" is real. The Atlanta Braves own the South. Alaska is basically a Yankees/Red Sox rivalry state, while Hawaii pulls almost exclusively for the Yankees. Nebraska is the most divided state. In the case of teams sharing a city, both the Mets and the Oakland A's are completely overshadowed by the Yankees and Giants, respectively. ...And almost nobody is a Miami Marlins fan.